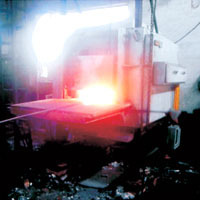 The Electric Forging Furnaces are developed utilizing premium grade raw material and innovative machinery in strict conformation with the international quality norms and standards. The offered range is available in different customized specifications and forms in accordance with the diverse requirements of clients. Silicon Carbide Heating Elements are designed for high temperature thermal processing applications for use in furnaces or kilns and as a radiant heat source. The advantages of using silicon carbide heating elements are manifold. These elements are economical, dependable, clean, quiet and safe. Spiral Silicon Carbide Heating Elements are manufactured from ALPHA Silicon Carbide and are available in a very large range of sizes form 12mm to 50mm diameters and in lengths of up to 2250mm.Three Piece Silicon Carbide Heating Elements are a resistance type silicon carbide heating element.The extremities of the elements are metalized with aluminum to provide a low resistance contact surface to which the electrical connections are made with braided aluminum straps.